Granola almost always has Oats in it. 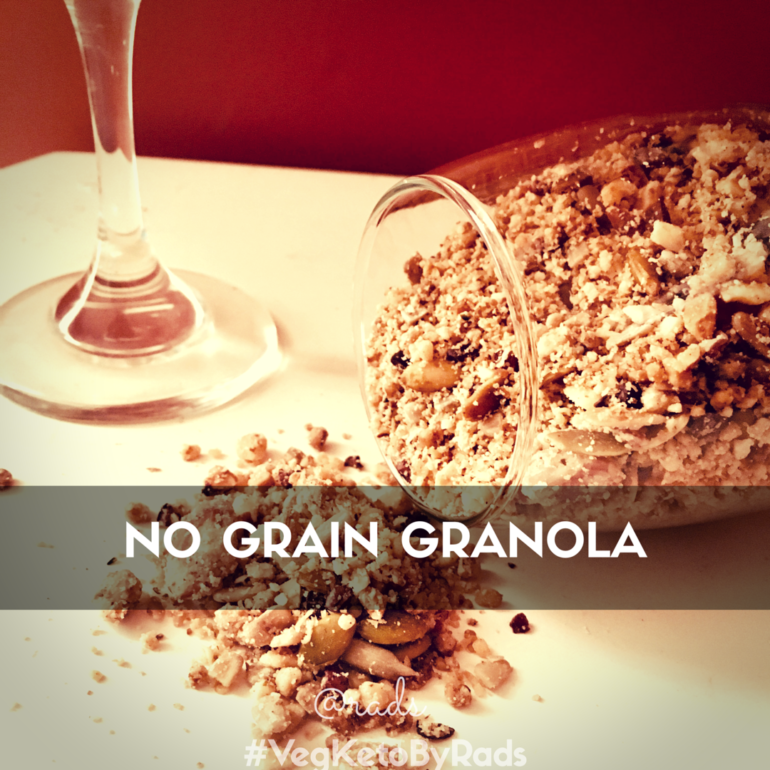 That’s the only grain as such, when you look at a basic granola without the frills. Every since Ive gone low carb, eating cereal is an occasional once a week or fortnight thing. I like the crunch and I think it’s become a comfort food of sorts to wake up to a bowl of delicious cereal and hot coffee. 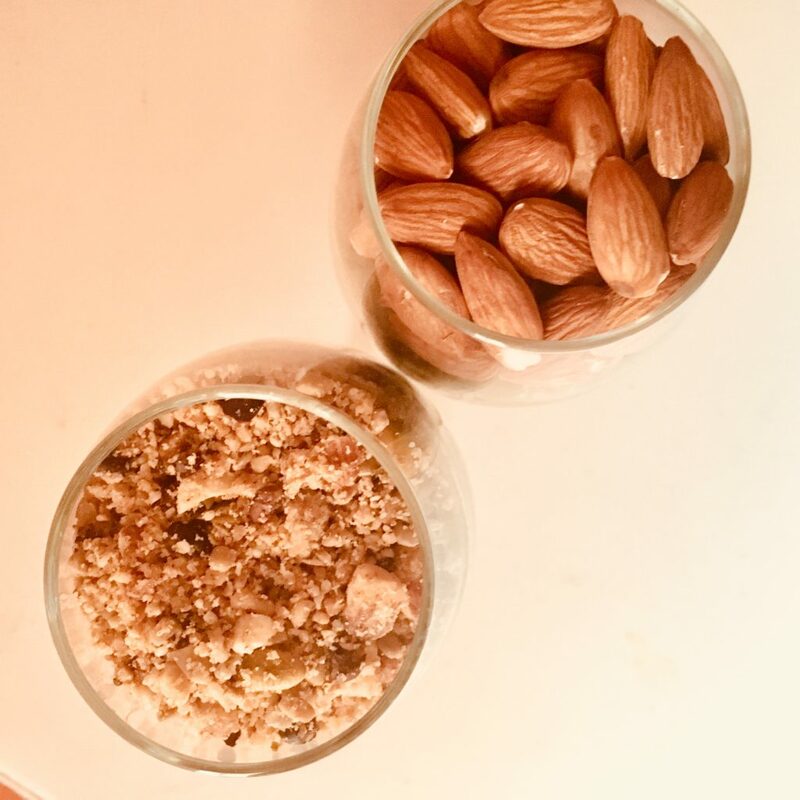 Sometime over winter I craved it so bad, I decided to make myself something that would work close enough and well, that’s how this No Grain Granola happened. There isn’t a proper recipe as such, and by that, I mean, you can tweak it and add or discard the ingredients to suit your palate. 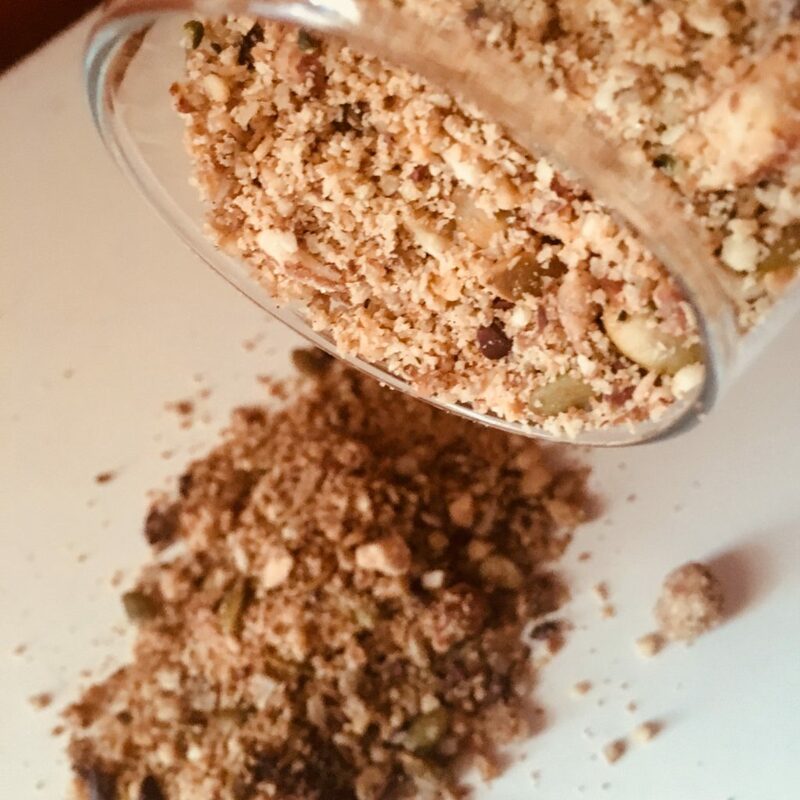 After making 2 batches with a mix of different nuts and seeds, this is the third one and this particular No-Grain Granola works perfectly for me, taste wise. 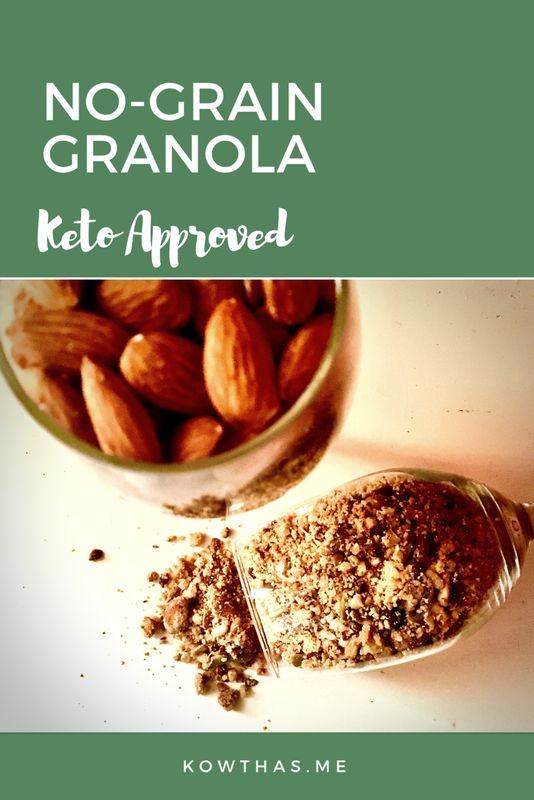 This granola is a rich blend of fats and proteins and of course carbs too, but the way it all comes together is simply wonderful and the best part is it isn’t really chewy and dry and it blends well with whatever milk you use. I barely take more than 4 tablespoons of it, and because it’s so rich, it keeps me full for a long time. I add a berry, some almond milk, and occasionally some peanut butter or more cacao nibs to change the flavor up. Add all the nuts and seeds together and blend them into a powder, not fine, but with still medium pieces. They should be powdered and mixed in together. Add 3 sachets of stevia, the cacao nibs and the coconut flakes and mix it well. Next add the almond flour or meal, pinches of salt and mix well. Now add melted butter and that will help bringing the nut mixture come closer into some clumps and not stay dry. (Add the essence at this point if you’d like. I don’t.) Feel free to add some more butter if you think the mix still feels dry. Spread the granola mix evenly (and not too thick) and let it roast for a good 20 -30 minutes. Occasionally, mix the granola, so it gets roasted equally and well. 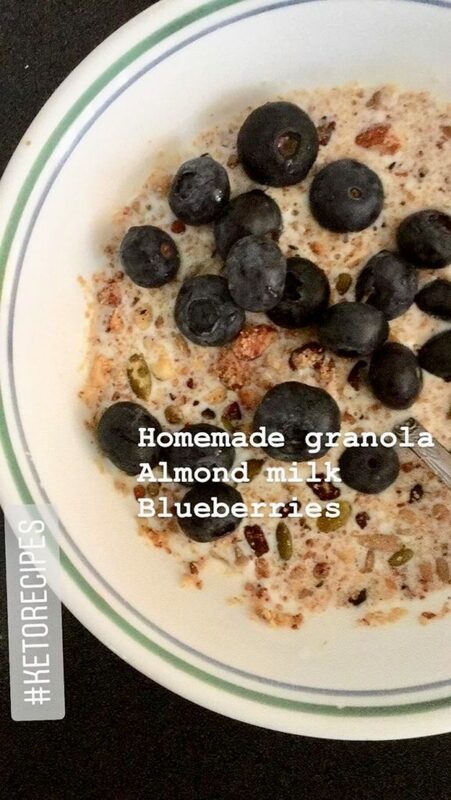 Add some almond milk and blueberries to the mix and you have a very tasty No Grain Granola for breakfast! I usually do them in small batches so I have better control. Coconut flakes tend to burn if they aren’t mixed in thoroughly, so I’d watch for that. I do not add any dried berries or any kind of fry fruits to the mix to store. Adding them over as a topping helps in portion control as all dried fruits do have significant sugar. All the measurements could be varied according to your taste. 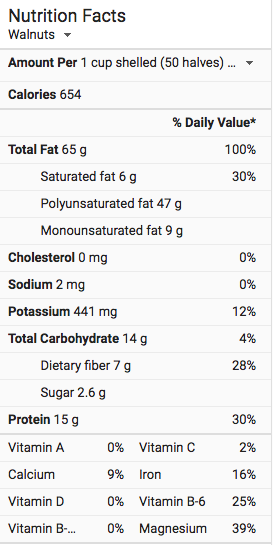 I like Almonds, but you could also also increase Walnuts/Cashews etc according to your taste. Sprouting these nuts and seeds will enhance the protein level significantly, but that’s a whole different procedure and time commitment. This works plenty for me. Hello, have even seen how many gram of protein and fats are there in these nuts and seeds? Almonds and Walnuts here for you! Are you on Instagram or Pinterest? Say hi! And if you do make a bowl of this, share it with me? I’d love to hear back! Awesome recipe. I have to make that granola this weekend! Thanks for sharing. It looks delicious. 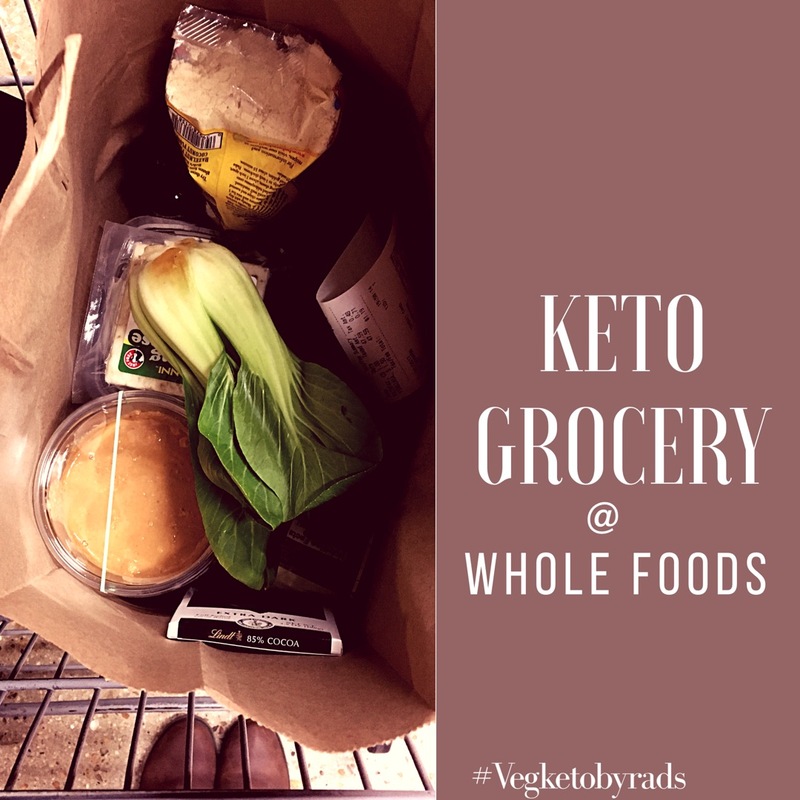 Erin recently posted…KetoSports KetoCaNa Review – Is it any good? Thanks Erin! Did you get a chance to make it?